As you start looking at wedding and engagement rings, you are going to have some choices to make and some different things that you need to be able to consider in detail. Here are some of the tips that can help you to choose your wedding ring. 1. You Don’t Have to Break the Bank. There are so many different types of rings out there, and most people (wrongly) assume that they have to spend a boatload of money in order to get a great wedding band or even engagement rings. London, New York, Rome - all world-famous cities with world-famous jewelers that all charge world-famous prices. There’s no need to spend on famous names. You’re honestly better off finding something that you like, and if it’s more affordable, why wouldn’t you get it? 2. Get Something that is Meaningful to You Both. You always want to put a bit of time and effort into choosing the rings that you want to get. Not only will it ensure that you both get something that you like, but it allows you to work out details like inscriptions or whatever else that you may want in there. Be sure that your rings reflect you as a couple. 3. Find a Material That Works Well For Your Professions. Does one of you work with your hands a lot? Then you may want to think about a material like tungsten or steel for your wedding band. If you work a job where you’re at a desk, silver, gold, or platinum is probably fine, but if you run the risk of getting your hands hit or working hard, you want a material that will last longer. Take your time looking for the best rings. 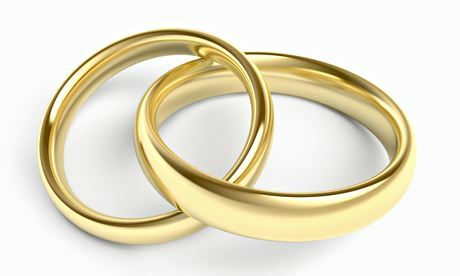 It doesn’t matter when you get your rings as long as they’re ready to be exchanged at your wedding ceremony. If you get really fancy rings you’re going to need some time for them to be made, but in other situations, you should be able to get them rather quickly. Above all else, you want something that is going to make you happy and that is going to symbolize you and your partner as a couple. You are going to be wearing this ring for the rest of your life and, as you work out what it is that you want it to be and how you can enjoy it, you want to look at your options and work out exactly what matters most. See what is out there, make some choices and know that you have some pretty solid options that will help you to work it out.